CNS lymphoma consists of 2 major subtypes: secondary CNS involvement by systemic lymphoma and PCNSL. Contrast-enhanced MR imaging is the method of choice for detecting CNS lymphoma. In leptomeningeal CNS lymphoma, representing two-thirds of secondary CNS lymphomas, imaging typically shows leptomeningeal, subependymal, dural, or cranial nerve enhancement. Single or multiple periventricular and/or superficial contrast-enhancing lesions are characteristic of parenchymal CNS lymphoma, representing one-third of secondary CNS lymphomas and almost 100% of PCNSLs. 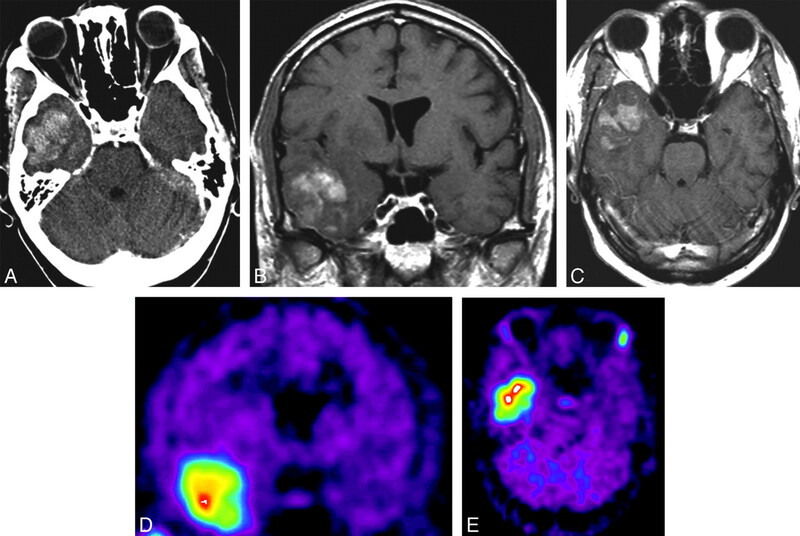 New CT and MR imaging techniques and metabolic imaging have demonstrated characteristic findings in CNS lymphoma, aiding in its differentiation from other CNS lesions. Advanced imaging techniques may, in the future, substantially improve the diagnostic accuracy of imaging, ultimately facilitating a noninvasive method of diagnosis. Furthermore, these imaging techniques may play a pivotal role in planning targeted therapies, prognostication, and monitoring treatment response. Early diagnosis of CNS lymphoma is crucial for proper management in both immunocompetent and immunocompromised individuals and is more likely if a tumor is observed on imaging.12,13 Although CNS lymphomas may have characteristic imaging findings on traditional CT and MR imaging, none of these will unequivocally differentiate CNS lymphoma from other brain lesions.9,14–16 A visible tumor on imaging is essential to raise the suspicion of CNS lymphoma, which then can lead to an early histologic diagnosis based on cytology of the CSF or brain biopsy. This pictorial essay reviews some typical imaging features at the presentation of CNS lymphoma on traditional imaging. Characteristic imaging findings with newer advanced imaging techniques that may potentially aid in the differentiation of CNS lymphoma from other brain lesions are also discussed. Parenchymal metastases from NHL often appear as single or multiple enhancing lesions and can be accompanied by leptomeningeal metastases.17,21 The parenchymal lesions may have a periventricular and/or superficial location (Fig 1). The typical MR imaging findings are quite similar to the findings in PCNSL; this similarity makes it impossible to discriminate these 2 entities on the basis of neuroimaging.16 As for all primary brain tumors and brain metastases, MR imaging is the imaging technique of choice for the detection of lesions and preoperative planning of surgical diagnostic procedures. 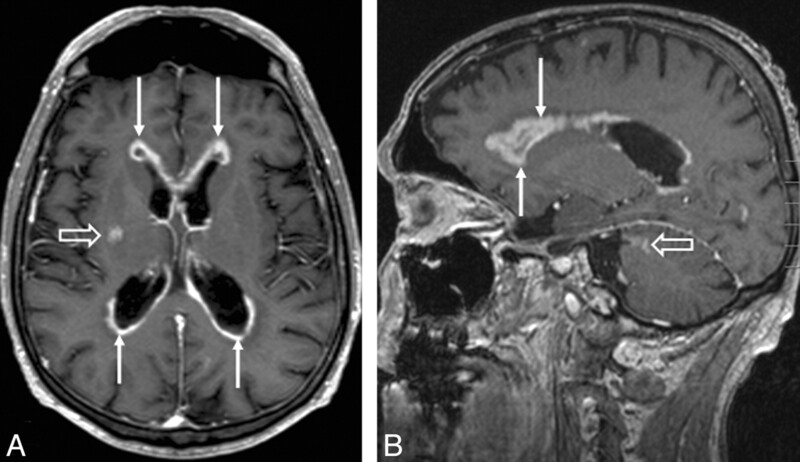 Axial (A) and sagittal (B) T1-weighed contrast-enhanced MR images in a patient with CNS metastases from NHL show diffuse subependymal contrast enhancement (arrows) and 2 parenchymal lesions (open arrows) in the right basal ganglia (A) and left cerebellum (B). Approximately 50% of the patients with CNS metastases from NHL have progressive systemic lymphoma at the time of diagnosis of their CNS manifestation.3 Furthermore, most of the remaining 50% of patients with apparently isolated CNS metastases develop systemic disease within months.3 Systemic manifestations of NHL thus commonly accompany the findings of parenchymal or leptomeningeal disease; these manifestations normally raise clinical suspicion of CNS metastases and lead to early cytology or brain biopsy to confirm the diagnosis. Solitary lesions on a noncontrast CT scan (A), contrast-enhanced CT scans (B and C), and an MR image (D) in 3 patients with non-AIDS PCNSL. 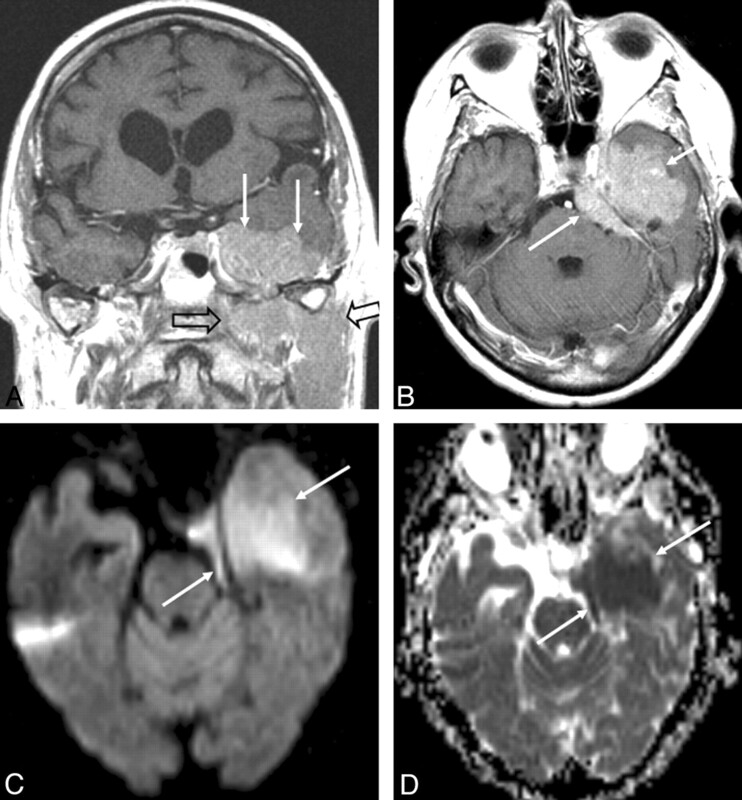 Note a hyperattenuated lesion in the frontal lobe on the noncontrast CT scan (A) with marked enhancement on the contrast series (B) and focal contrast-enhancing lesions in the left basal ganglia (C) and temporal lobe (D). One lesion has ring enhancement (D). Multiple lesions on contrast-enhanced axial (B and D) and coronal (A and C) MR images in 4 patients with non-AIDS PCNSL. Note lesions in the basal ganglia (A), ventricles (B), frontal lobes (C), and cerebellar lobes (D). 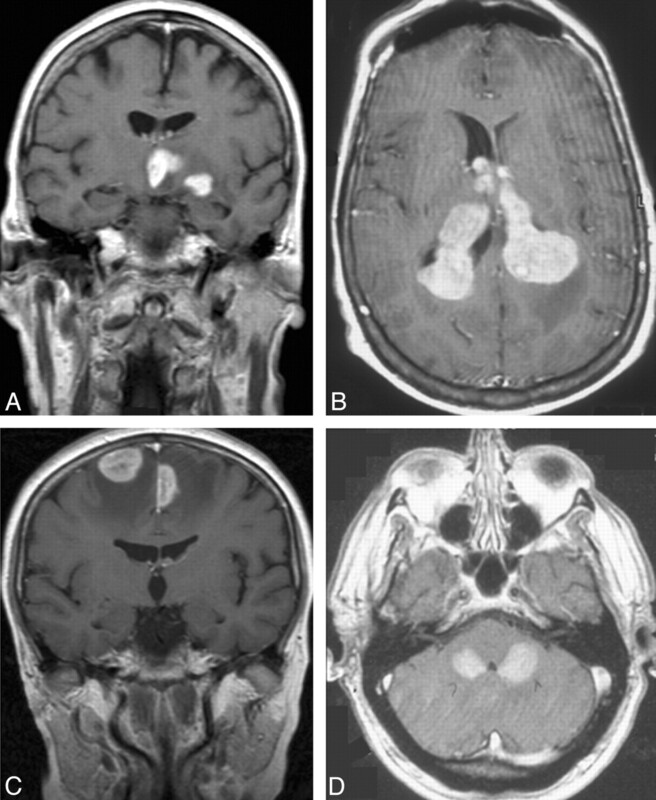 Coronal (A) and axial (B) contrast-enhanced T1-weighted MR images and an axial DWI (C) and ADC map (D) in a patient with primary dural B-cell lymphoma (arrows) with tumor spread below the skull base (open arrow). The contrast-enhancing tumor at the caudal surface of the left temporal lobe (A and B) displaces the temporal lobe cranially and resembles a meningioma. DWI reveals restricted diffusion within the tumor with high signal intensity on DWI (C) and corresponding low signal intensity on the ADC map (D). Contrast-enhancing lesions on CT scans (A–D) in 4 patients with AIDS-related PCNSL. 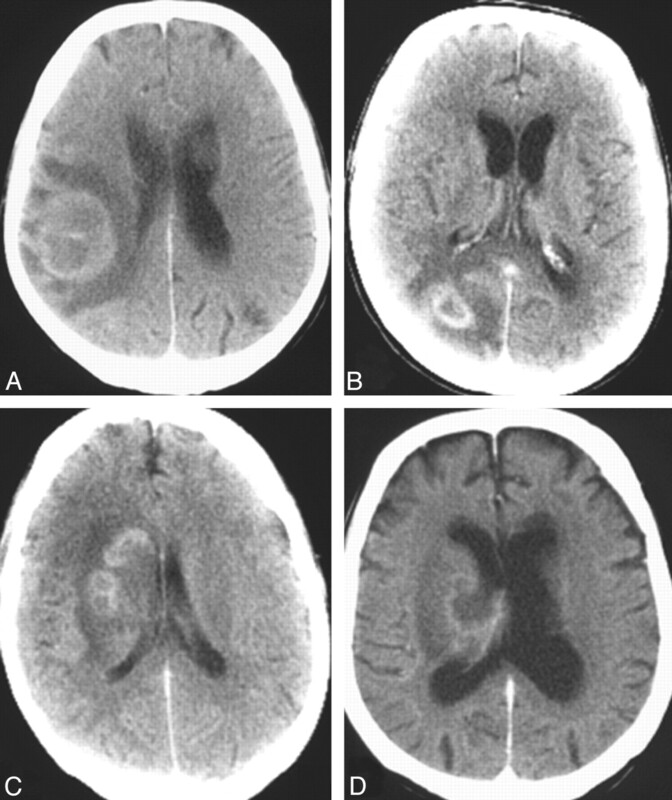 Note irregularly enhancing lesions in the right parietal lobe (A), right occipital lobe (B), and right periventricular white matter (C and D); most of the lesions show ring enhancement (A, B, and C). CNS lymphomas may have a characteristic appearance on traditional CT and MR imaging; however, none of these imaging characteristics will unequivocally differentiate CNS lymphomas from other neoplasms (eg, metastases from other malignancies, malignant gliomas, meningiomas) or non-neoplastic diseases (eg, multiple sclerosis, stroke, cerebral toxoplasmosis, pyogenic abscess).9,14–16 Furthermore, the typical imaging characteristics may not be present.14 DWI,25,40 perfusion MR imaging,40,41 and MR spectroscopy42,43 are increasingly used in clinical radiologic practice and may help to differentiate CNS lymphomas from other lesions of the brain (Table 2). A recent study showed that pretherapeutic ADC tumor measurements within contrast-enhancing regions were predictive of clinical outcome in patients with PCNSL.48 Low ADC values were predictive of shorter progression-free survival and overall survival. In addition, an inverse correlation was found between ADC values and the cellular density of the tumors. Patients with prolonged progression-free survival and overall survival also had a significant reduction in post-therapeutic ADC values.48 Thus, repeated ADC measurements may be used as biomarkers in the surveillance of therapeutic response. 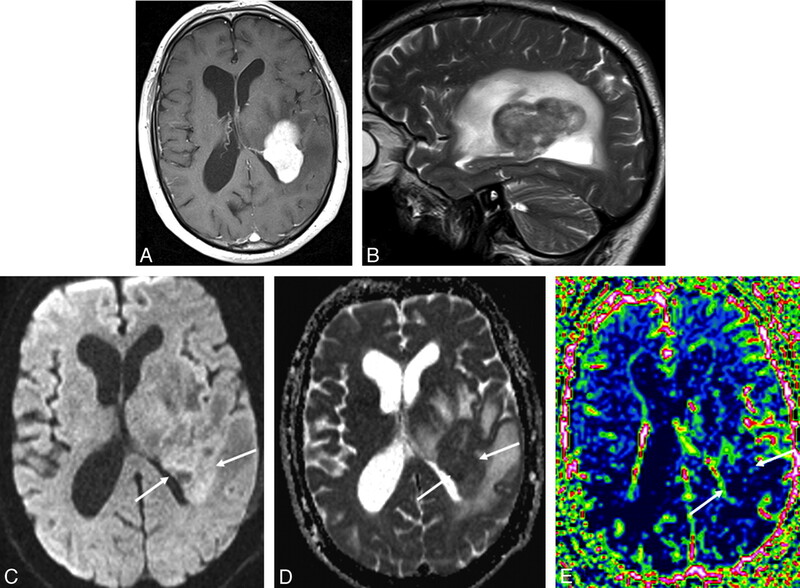 Axial contrast-enhanced T1-weighted MR image (A), sagittal T2-weighted MR image (B), axial DWI (C), an ADC map (D), and an rCBV map (E) in a patient with PCNSL. The periventricular contrast-enhancing tumor (A) in the left parietal lobe has restricted diffusion with high signal intensity on DWI (C) with corresponding low signal intensity on the ADC map (arrows, D). Perfusion MR imaging shows low perfusion within the contrast-enhancing tumor on the rCBV map (arrows, E). MR spectroscopy obtains biochemical information noninvasively from biologic tissue. Within a defined volume of interest, signals may be registered from chemical nuclei within the body; the most commonly used nuclei are protons (hydrogen). In PCNSL, proton MR spectroscopy has demonstrated elevated lipid peaks combined with high Cho/Cr ratios.29,42–44 These can, however, also be seen in glioblastoma multiforme42 and metastases but may help in differentiating PCNSL from other lesions. More recently, superparamagnetic contrast agents, (eg, iron oxide nanoparticles) have become available.55 MR imaging with iron oxide nanoparticles may help to distinguish malignant neoplasms from multiple sclerosis56; however, to our knowledge, the potential role of this technique in the diagnosis of CNS lymphoma has not yet been defined. Axial contrast-enhanced CT scan (A), coronal (B) and axial (C) contrast-enhanced T1-weighted MR images, and methionine PET (coronal, D, and axial, E) images in a patient with PCNSL. 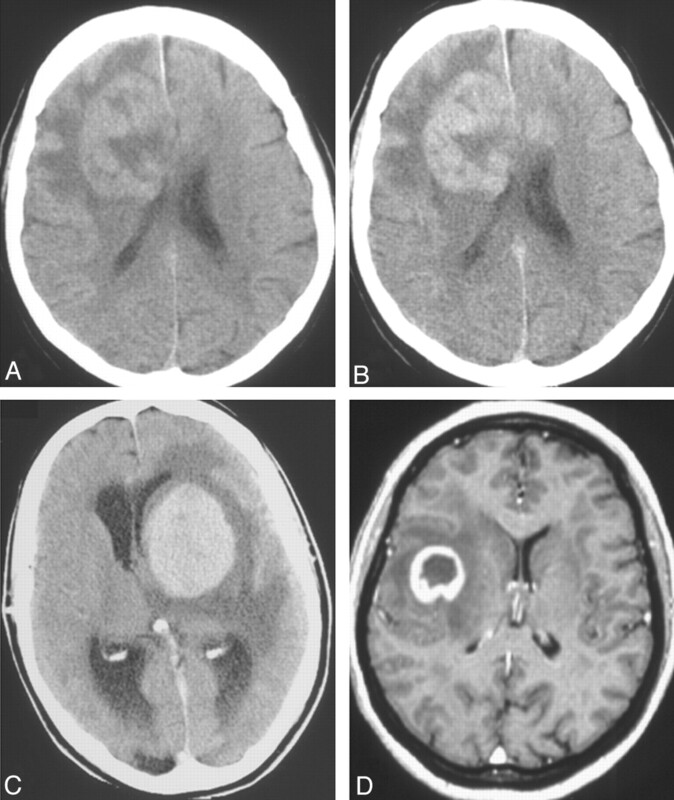 The contrast-enhancing tumor in the right temporal lobe (A–C) shows high uptake of methionine on PET (D and E). New PET, SPECT, and SPET tracers as well as new MR imaging contrast agents that may potentially reveal important aspects of tumor biology are currently being intensively investigated by researchers all over the world.55,65 This research may provide new insights that will substantially improve the preoperative diagnostic accuracy of imaging, enabling an appropriate diagnostic procedure as well as early active treatment in this patient group. In the future, improved advanced imaging techniques may noninvasively provide an accurate diagnosis, obviating surgical biopsy before the initiation of chemotherapy, radiation therapy, and new nonsurgical therapeutic regimens. An integrated PET/MR imaging system has recently been developed that gives simultaneous morphologic and biologic information, creating new possibilities for complementary information.66 Some of these newer imaging techniques will presumably play a pivotal role in the planning of new targeted therapies, in monitoring treatment response, and in the prediction of treatment outcomes. When CNS lymphoma is suspected, contrast-enhanced MR is the imaging technique of choice. Secondary CNS lymphomas present as leptomeningeal metastases in two-thirds of the patients and as parenchymal metastases in one-third. In PCNSL, almost all patients have parenchymal lesions. Parenchymal lymphomas have a predilection for the periventricular and superficial regions, often abutting the ventricular or meningeal surfaces. Although CNS lymphomas may have characteristic imaging findings on traditional MR imaging, none of these will unequivocally differentiate CNS lymphoma from other brain lesions. New advanced MR imaging techniques and PET and SPECT metabolic imaging have identified characteristic findings in CNS lymphoma that may aid in the differentiation of CNS lymphomas and other CNS lesions. In the future, improved advanced imaging techniques may provide morphologic and biologic information noninvasively and, thus, an accurate diagnosis. Furthermore, these imaging techniques will presumably play an important role in the planning of new targeted therapies, for prognostication, and for the monitoring of treatment response.